The decision to have a fourth child wasn’t an easy one. We had the first three with only a three and a half year age gap between the eldest and littlest and now will have a gap of almost double that. In some ways life has just started to get a little easier, all three children can fasten their car seats for example, they can help themselves to snacks and drinks of water, but on the other hand I feel like time has slipped away from me. How do I have an almost 10 year old? Hannah is an August baby so I lost a year of her being at home and her time at Infant School seems to have passed by ridiculously fast. I was worried about being an ‘older mum’ too even though I’m only 36, which doesn’t feel that old, but seems to be in medical terms. In the end we decided to go for it, and I’m now almost 16 weeks pregnant, the kids are beyond excited, and keep asking to see/feel my ever expanding tummy. I’ve been lucky so far and haven’t felt too sick, although the tiredness has been almost overwhelming this week, but I think part of that is this cold, miserable weather. I chose to have the combined test of nuchal fold measurement and blood test offered by the NHS, as I like to be prepared and if anything was seriously wrong that could be detected at such an early stage I wanted to know about it. The tests came back low risk from an NHS point of view, but concerning to me. I had/have a PAPP-A level of 0.24. this should be 1 and anything under 0.4 is classed a low. If you haven’t heard of PAPP-A this article on Wikipedia summarises nicely, but is pretty terrifying also. I agonised about what to do, did I wait for my 20 week scan and then see how things looked, should I beg the Midwife to redo the combined test, should I pay for a second combined test? Eventually my googling ( not recommended in this situation by the way ) informed me of a non invasive 99% accurate chromosome test, called the Harmony Test. It was a significant amount of money, but I decided it would be worth it to stop me worring for the nest 6 months and at least hopefully rule out one of the concerns with low PAPP-A. The test itself was very easy and stress-free. I had a quick scan to check baby was still ok. He’d already gown so much since my earlier dating scan and had a slightly smaller head in relation to his body, I saw the hemispheres of the brain, which was AMAZING and he waved his arms and legs around at me. After the scan I was taken through the procedure, warned about what would happen when the results came back and then a lovely nurse took two vials of blood. The results came back in 6 days, a nurse phoned me and then e-mailed them over. Luckily everything looks good and the baby in very low risk for all the chromosome disorders tested for and we found out it is a boy! My extensive internet research tells me low PAPP-A doesn’t always result in problems, so I am just trying to look after myself, and hope for the best. I have an extra scan with a specialist booked in at 24 weeks to check the placenta, so I guess we get to that point and go from there. Congratulations on your wonderful news. It has put a big smile on my face. You really are superwoman with all your do, the studying, science stuff and everything else. I can not wait to meet your baby boy. Rebecca Beesley recently posted..I’m a tumble-dryer convert! Cass Bailey recently posted..Homemade Bird Feeder in a mug…. It’s so hard not to worry isn’t it? I had a very high risk of chromosomal conditions with my youngest, and it was agonising waiting to find out more. In the end I had a CVS, which put my mind at rest. I’m crossing all my fingers for you, and hope everything is plain sailing. And congratulations! The CVS must have been such a worry Helen. I am glad I had the Harmony test, as it has put my mind at rest a little bit. Emma congratulations on baby number four and how exciting you will have two of each! 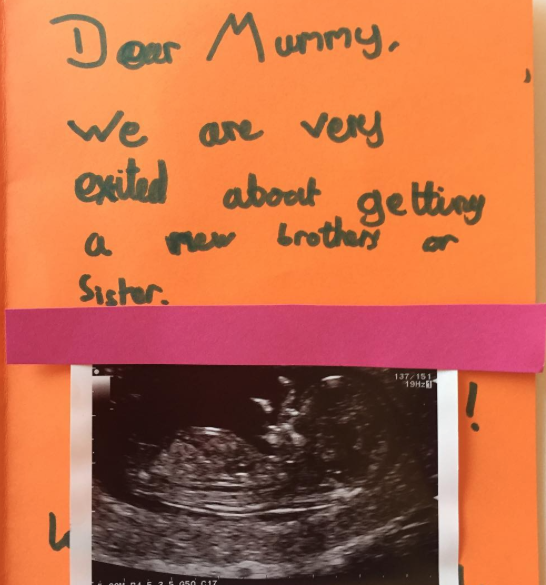 Glad you are having a good pregnancy so far, that the kids are so excited too, that must be amazing for them, you are such a fab mum, four will be such fun. Such a beautiful note from the kids! I am sure it can be so hard not to worry…I always wanted more than two children but life determined me to say ok…let’s just stick to two. I am also 36 but too overweight to even think about having a third child. I am really excited for you and will be thinking of you and keep my fingers crossed! PS:I have two friends that gave birth this month and they are both 36 and their kids are completely fine. So you can do it too! Huge congratulations to you! It sounds like the tests were really worth it, anything that helps take away stress when you are pregnant is a very good thing! Oh my goodness Emma this is SO exciting, what wonderful news for a Tuesday! And how superb, you’ll have two of each. You must be thrilled, massive congratulations. Pregnancy is always a worrying time isn’t it. I had scans from 5 weeks to 38 weeks on a regular basis as I’m on anti epileptic drugs (and ancient!) but I was so well looked after. I can’t believe she’ll be six on Christmas Day.